I wish my back story were more captivating but the truth is, my interest in writing started when I was in grade school—I thought I was a poet. The whole I’ll-help-you-sell-more-stuff thing didn’t come until after a career in broadcast journalism. The important thing is that I have been working at my craft for more than three decades and I bring the same passion to my work now as I did when I wrote (really bad) poetry. As a professional communicator, I am captivated by the power of language. I believe my role is to develop products that do more than simply inform—they must also persuade and inspire. Whether I am promoting an idea, a vision, a product or a service, I am single-minded in pursuit of one goal: to produce communications products that get you results. Perhaps my greatest strength—this is no time to be modest!—is my ability to hit the ground running. My wide base of knowledge (gained as a trained journalist and professional writer) and my intense curiosity (I was born with that) allow me to identify which elements of a story are important to people and which elements will help sell the product, service or program. 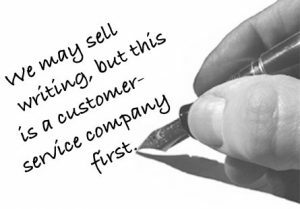 I believe one of the biggest differentiators I bring to the marketplace is that I believe mine is not a writing company, but a customer-service company that happens to sell top-quality writing and editing services.